In North America, Snap Samplers can be purchased directly from QED. Call us at (800) 624-2026 or email us at Info@QEDenv.com or see our Contact Us page for additional options. For other parts of the world, contact us and we can lead you to the appropriate reseller in your region. Snap Sampling....What do I need? 1) Snap Samplers—these are the individual units that each hold one Snap Sampler bottle. There are two types, the 40ml size and the 125ml/350ml size. You choose a combination of these from 1 to 6. 2) Trigger system—this is the part that is used to the lower the Snap Samplers into position and also “snap” the bottles closed. There is a manual trigger system for depths up to 50ft/15m; and a pneumatic system for deeper sampling (tested to 2000ft/600m, but no maximum depth has been established. 3) Well Dock—this is the item that you hang the Snap Samplers from at the well head, and doubles as a locking well cap. The 40ml and 125ml bottles will fit in 2-inch/50mm well bores, while the 350ml bottle requires a 4-inch/100mm bore diameter to fit. Snap Samplers ONLY accept the double end opening Snap Sampler bottles. “Normal” single-ended bottles you typically get from a lab will not work with the Snap Sampler. Snap Samplers can be stacked in any combination up to 6, meaning that you can multiple bottles of different types “stacked” together for your particular analytical requirements. The last item you need to complete the system is a Tool Kit to deploy, trigger, and prepare sample bottles. For the manual trigger system, there is just a hand tool kit. For the pneumatic system, there is a tool kit that includes the hand tool kit, plus a pressure manifold with gauge, an air pump, and an optional battery pack, all contained in a Pelican case. Sometimes users want conduct a PILOT TEST to demonstrate the method prior to committing to the method change. We are happy to help you design a test program to achieve those goals. We also have a RENTAL PROGRAM to make conversion to Snap Sampling as economical as possible. You rent/buy Snap Samplers at a reduced cost, along with the trigger system, bottles and docks. For the P3 program, you use the Snap Samplers as you normally would for 1 or 2 sampling events. When the Pilot phase is complete, you pay the remaining cost of the Snap Samplers in 1 or 2 additional installments. For the pilot phase, the reduced Sampler cost means that the equipment is usually about half or less of the cost of buying the equipment outright, and the savings associated with easy and quick Snap Sample collection means that you may not ever pay more than your current cost for sampling by purging. Continue Snap Sampling and pay the remaining cost for the purchased Snap Samplers. What’s really convenient about the P3 approach is that your next set of bottles is already deployed--so you have no separate mobilization to collect the next round of samples. It's that easy! Contact us today to talk about what works best for you! For the Rental Program, longer payment arrangements can be made. Contact us to find out how. * We can spread your Snap Sampler equipment purchase over several sampling events. Depending on current cost considerations, many users will never pay more than they are currently paying during the purchase phase. Ongoing savings after purchase are considerable, often 50%, 60%, even 70% or more. We’ve found more and more people are using our Well Caps, even if they are not Snap Sampling! We do sell them separately! The ProHydro Well Dock includes a support ring that can be used to hang equip- ment. 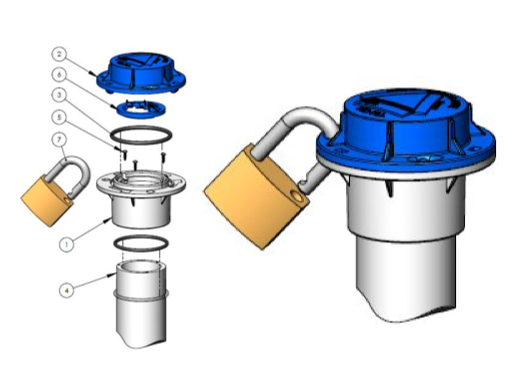 Importantly, the locking cap can be removed without moving the support ring, so, if you have a pressure transducer or other gear deployed downhole, you can take manual water level measurements without moving what is hung at the well head—a unique feature.